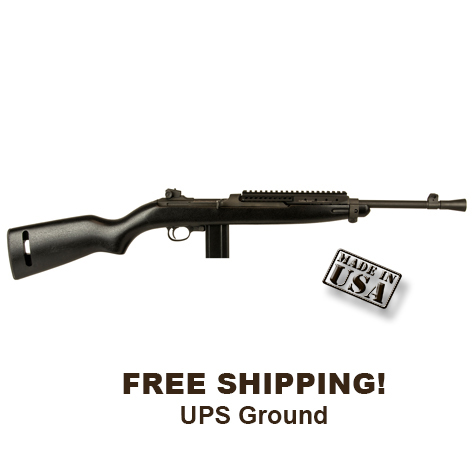 Inland Depot Home>>M1 Carbines and Accessories>>M1 Carbine "Scout"
The M1 Scout carbines feature many of the same characteristics of the original Inland Carbines and are manufactured in the USA! The M1 "Scout" carbine has the same features as the M1 "Jungle" carbine which includes a threaded flash hider and 15-round magazine. The flash hider is a conical flashider and is threaded ½” x 28 tpi allowing the use of your favorite accessories with the same threads! The Scout features a polymer / textured wood stock and aluminum picatinney handguard which allows the use of a extended eye relief "Scout Mounted" scope or electronic optics. Like the 1944 & 1945 models, the Scout Carbine features adjustable rear sights, push button safety, round bolt, and "low wood" stock. Twist rate: 1 x 20"